Plain, non-reflecting & Conservation glass and backs to suit any frames may be supplied on request. Also available is a complementing range of ready cut, single or double mounts with rectangle or oval apertures. These come in a classic range of colours to set off any picture. Gold lined mounts give an extra sparkle for something special. For made-to-measure frames we have over 500 moulding patterns. These range from traditional through to modern designs, in sizes from 3/8" to 4" and made of timber or metal. With finishes varying from many different gold and silvers, to wood grains ranging light finishes to dark finishes, both natural and polished finishes. Also many colours some of which are black, white ,blue, red, green, pink, with many different mixes of many of the above. 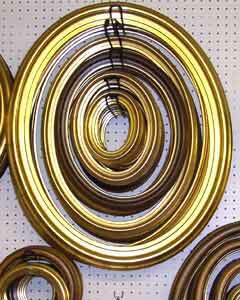 Metal framing is available in Gold, Silver or coloured. With colours ranging from natural hues, through primaries to hand coloured we are sure to have the right one for you. Combined with our huge range of mount colours, including traditional washed line, used singly, or in any combination, your frame will be tailor made to complement any art work. Working using traditional methods we are able to frame, besides pictures of all types, tapestries and embroideries. More modern techniques such as bonding and dry mounting are also used where appropriate. We also frame the more obscure things such as t-shirts, cigarette cards, medals or anything else which lends itself to having a frame around it. If you have a framing requirement we haven't mentioned, contact us. We are sure to be able to help. N.B. Pricing - Because we have such a large range for you to choose from pricing via email or phone is difficult. It is best if you can pop in with your sizes or items to be framed where you can pick your perfect combination, we can give you a price of which you are under no obligation. Easy!